Prices include VAT at 20% when it is applicable. We aim to hold stocks of all lines illustrated on our website and aim to despatch goods within 24 hours of receiving an order. However, at times of exceptional demand, delivery may be extended. We will however inform you accordingly. We reserve the right to amend postage and packing pricing as appropriate. We regret that due to flying restrictions, liquids, aerosols & gels can no longer be delivered outside of the UK & Ireland. Please check the condition of your parcel upon delivery prior to signing for acceptance. In the event that goods are missing or damaged on arrival, please specify against your signature and inform us immediately, within 3 working days, otherwise no claim can be considered. You have the right to cancel any orders up to and including 7 working days after receiving the goods. All cancellations must be made in writing either by post or email within 7 working days (excluding weekends and UK Bank holidays) starting on the day after you receive the goods. Cancellation by telephone is unacceptable unless followed up with confirmation in writing in a timely manner. Reasonable care must be taken of the goods. Please note: the date of cancellation will be the date on which we receive your notice of cancellation. This does not apply to customised items (such as embroidery), underwear, perishable items, earrings for pierced ears, audio, video or computer software in unsealed packaging. You will receive a full refund including delivery costs within 30 days of receipt of cancellation. All Credit Card transactions are processed online using PayPal checkout over a secure SSL connection, and you will receive online confirmation of payment authorisation. 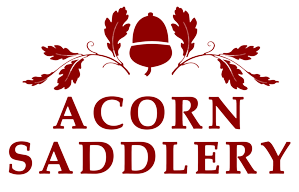 Acorn Saddlery take all reasonable care to keep the details of your order and payment secure, but in the absence of negligence on our part we cannot be held liable for any loss you may suffer if a third party procures unauthorised access to any data you provide when accessing or ordering. A full refund (less postage and packing) will be provided on any item returned to us in the original packaging, unsoiled, within 14 days. Alternatively the goods may be exchanged. Refunds or exchanges cannot be made before we receive the returned goods. Returns made after 14 days or soiled goods will not be eligible for refund or exchange. Please a) pack carefully to avoid damage b) enclose the appropriate return postage and packing fee with goods returned for exchange c) we recommend that you obtain a certificate of postage with adequate insurance from the Post Office if making a return, (to enable you to make a claim for any loss or damage), as we are unable to compensate for return parcels that are lost or damaged in transit. We are committed to protecting your privacy and we comply with the Data Protection laws applicable to the UK. We use the information we collect about you only to process orders.